June 18, 1959 - June 26, 2017. Nikolaev, Ukraine. In 1982 graduated National Pedagogical University named after K. D. Ushynsky, Department of art graphic, Odessa. Since 1982 is a member of National Union of Artists in Ukraine. Painting. Author's works are presented in collections of Ukrainian National museums in Kiev, Odessa, Nikolaev, Lvov and a lot of other private collections in other countries. Lived and worked in Nikolaev, Ukraine. 2016 Sentimental skier, CCA "Soviart", Kyiv, Ukraine. Hopscotch, Gary Bowman’s art gallery, Mykolaiv, Ukraine. 2013 Elements, "In Spasskaya, 45" gallery, Mykolaiv, Ukraine. 2011 Painting, Art Center "Kvartira", Mykolaiv, Ukraine. 2010 Journey to Markitaniyi, Art Gallery PRIMUS, Lviv, Ukraine. Solo exhibition, KVARTIRA ART-center, Dnipro, Ukraine. 2009 Anniversary exhibition, Mykolaiv, Ukraine. 2008 A boat sail, Artzebs gallery, Zaporizhya, Ukraine. 2007 Naked ..., Contemporary art gallery Barannik (Lenin), Zaporizhya, Ukraine. 2006 Solo exhibition, Mykolaiv, Kyiv, Ukraine. 2003 Solo exhibition, Mykolaiv, Ukraine. 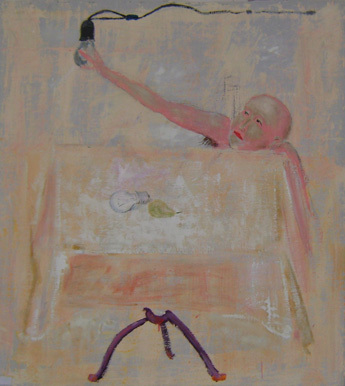 2002 Solo exhibition, Odessa, Nikolaev, Ukraine. 2000 Solo exhibition, Odessa, Ukraine. 1996 Solo exhibition, Kyiv, Ukraine. 1993 Solo exhibition, New York, USA. 1992 Solo exhibition, Munich, Germany. 2015 Oh, there, at the hill... , Vereshchagin Art Museum, Mykolaiv, Ukraine. 2012 Viva Mexico! (within the framework of the Festival of Latin-American culture “Casa Latina”), "In Spasskaya, 45" gallery, Mykolaiv, Ukraine. 2009 As a variant, International symposium of contemporary art "Biruchiy 009", Zaporizya, Ukraine. 2008 Who are you?, International symposium of contemporary art "Biruchiy 008", Zaporizhya, Ukraine. 2007 Hippie E!, international symposium of contemporary art "Biruchiy 007", Zaporozhya, Ukraine. "Ukrainian Days in Russia", Moscow, Russia. 2003 16th international art salon, Libramont, Luxembourg. 2001 Triennalle - 2001, Kyiv, Ukraine. 1994 ART-EXPO, New York, USA. 1990 "Українське малARTство (60-80 рр. )", Kiev - Odense, Denmark.